The writing is seamless. Our heroine is a brilliant architect who moves from L.A. to Seattle with her husband and daughter and finds everything about the earthy northwest culture insufferable. Example: “Did you know there are only two hairstyles in Seattle: short gray and long gray?” And wait til she gets started on Canadians, recreational clothing, and Craftsman-style houses. It’s too good. The narrative is fun, too, alternating between Bernadette’s voice and that of her daughter, husband, and several other characters to weave a punchy story about a family who’s on the brink of crisis but ultimately pulls together. It’s refreshing in every way. Start this book today, finish it by Sunday, then post here and thank me for rescuing your summer reading. It’s mid-July, after all, and I’d say that’s the perfect time to put down those classics you’ve been gnawing on and gulp down a treat. This one goes down smooth, sweet and cool—because nobody’s cooler than Bernadette. Enjoy! 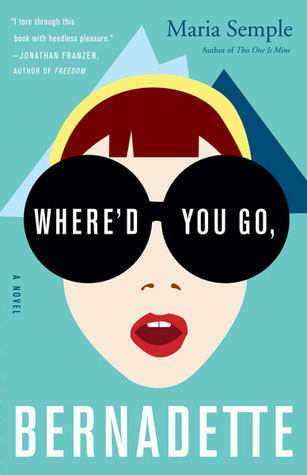 “Where’d You Go, Bernadette” goes down smooth, sweet, and cool. about his life as a writer and all that he’s learned from it. This last book sounds a bit underwhelming after the first two, but Good Prose was actually my favorite, because in addition to a warm and engaging memoir, it’s packed with gold-standard writing advice. I know this pales in comparison to the drama of his other works, but I guess sometimes (all of the time) I find what’s happening in our swirly heads more interesting than what’s happening in the real world. I know that’s a weakness, but I can’t help myself. Our swirly heads are just too yum. 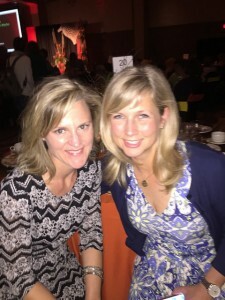 We met in the lobby of the Portland Hilton (loving this new venue, btw—shiny, pretty, sparkly) and sauntered into the ballroom where all manner of wonder and delights awaited us. The tables, the flowers, the food; all were in glorious array at our glorious disposal. We sat down with just minutes to gossip before the lovely Renee introduced the lovely Mr. Kidder to the stage. And lovely he was. Unlike most Bella Voce speakers, Mr. Kidder accompanied his talk with a slide show highlighting the people he’d written about and the communities he’d grown to love. He spoke sparingly of his own writing, and then only in the context of the humanitarian work that his writing has tried to serve. 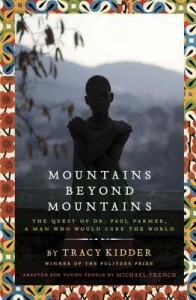 He was modest and self-deprecating, speaking quietly and passionately about Village Health Works and Partners in Health, the nonprofit organizations founded by the real-life heroes of his books. (Click on those links, it’s pretty amazing stuff.) 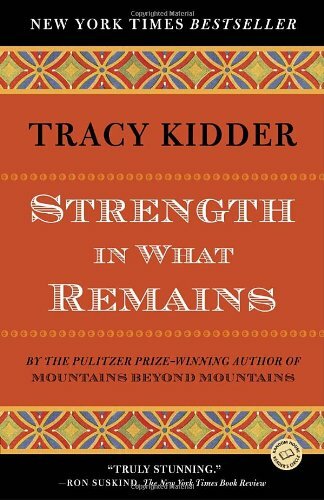 Listening to this soft-spoken giant of his profession, it became clear that Tracy Kidder was as much a humanitarian as a writer—and a model of both. What better way could he have employed his tremendous talent? Mr. Kidder has received the highest honors of the literary world and he uses them to heighten and honor the real world around him. He’s found the best and kindest way to serve in both. Like I said: lovely. 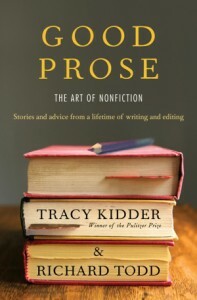 Tracy Kidder is as much a humanitarian as a writer, and a model of both. So lovely, in fact, that I made Rachel take a picture of me with him afterward. And would you (and Tracy) forgive me if I admitted that it was among the most awkward moments of my life? 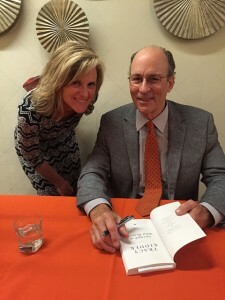 I’ve waxed embarrassing about stalking Rebecca Skloot and Jess Walter at past Bella Voces, but the sum dorkiness of those two encounters doesn’t equal the humiliation I suffered upon meeting Tracy Kidder. Even now, I can’t quite explain why. He was polite, I was polite, Rachel was polite (though silently smirking behind the camera, I could feel it.) All went well when I asked him to sign my book, but when I asked if I could take a photo with him, he didn’t really say anything. (Though I thought I heard him mutter something under his breath, it kinda sounded like self-aggrandizing-opportunist something-or-other, I don’t know, it was loud in there.) And though he acquiesced, he didn’t quite make eye contact, just smiled and stiffened. So I smiled and stiffened. Then we both smiled and stiffened, and then Rachel took the picture. It. Was. Awful. Perhaps it was so awkward because of the author’s modest demeanor; he didn’t seem the type to entertain groupies. Or maybe it was because not a SINGLE SOUL in the ballroom had asked for a SINGLE PICTURE with him—probably because he was so accomplished, and compassionate, and sincere, and therefore seizing a photo-op for personal gain may have been considered poor form to ladies of a certain class and breed. But: whatever. Rache and I had fun. After such an uplifting dose of moral and intellectual stimulation we decided to keep things real by hitting the shops downtown. 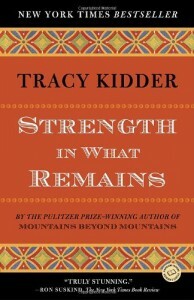 (Tracy’s lessons of economic development weren’t lost on us; it was the least we could do.) 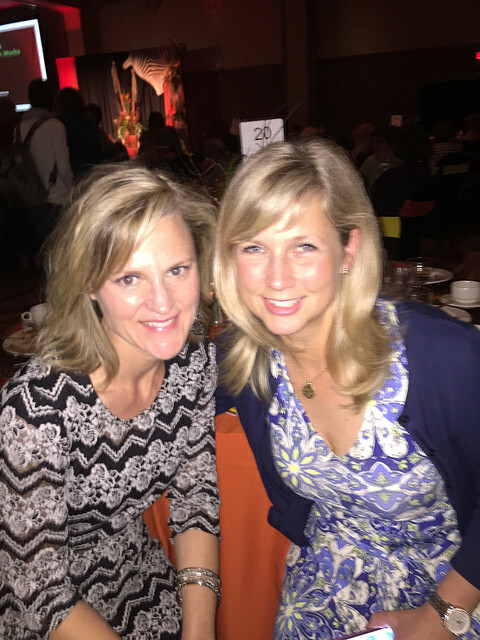 Our table hostess snapped this photo of us before we left, and Rachel had the nerve to hashtag it #wearesuchdorkswhenwemeetcelebrities. Actually, we’re pretty darn dorky when we meet up anytime (as implied by the phrase “pretty darn dorky”), but isn’t that half the fun? It was a great day, in spite of this photographic evidence that the bouncy, dewy look I’d attempted that morning had devolved to crusty and greasy. Rachel, of course, looks like a glowing and gorgeous twenty-year old But: whatever. Even among besties, one of you has to be hotter than the other. I’ll take second to her anytime.